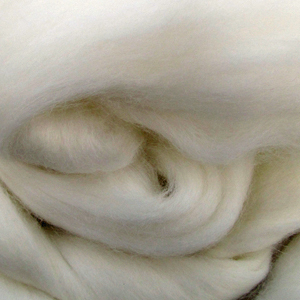 ﻿ Angora Fibers from Weaver Creek Fibers, wholesale purveyors of luxury fibers. Our Angora Top is of the finest micron level and is bright white. It dyes beautifully with a soft glow. Spin it with a lot of twist for the best yarn. It has an approximate micron of 16. Angora fiber comes from long haired rabbits of all shapes and sizes. Small raisers often feature beautiful colors from silver to auburn but most commercially produced angora comes from pure white rabbits with large bodies and the ability to produce long coats, which are sheared for collection. The rabbits regrow their coats, making angora as much of a renewable resources as wool or down fibers. We recommend spinning any angora blends with a lot of twist, to lock in the "shed", give the yarn bounce and then allow the bloom to emerge as the end user works with and wears the yarn. It takes dye in a lovely soft manner and adds a halo to blends. The Angora rabbit is a domestic rabbit bred for its long, soft wool -- finer than cashmere. Angora rabbits must be plucked of their wool every three to four months throughout the year. Angora is very soft, fluffy, light and warm. Angora exists in 12 registered colors including whites, browns, reds, blues and blacks. Angora has a fineness of approximately 13 microns. Angora is slippery and often blended with wool. The shedding of fibers from finished fabric is less if spun using the woollen long draw method. We are pleased to provide Super Angora Top which is very fine at 12 microns with a staple length of over 2 inches in a bright pure white.